Let’s admit it; holidays are stressful. With time-consuming and challenging planning a standard part of any holiday process, additional anxiety is overwhelming. Unfortunately, added stress is the reality for many that are meeting and spending the turkey holiday with a new family. 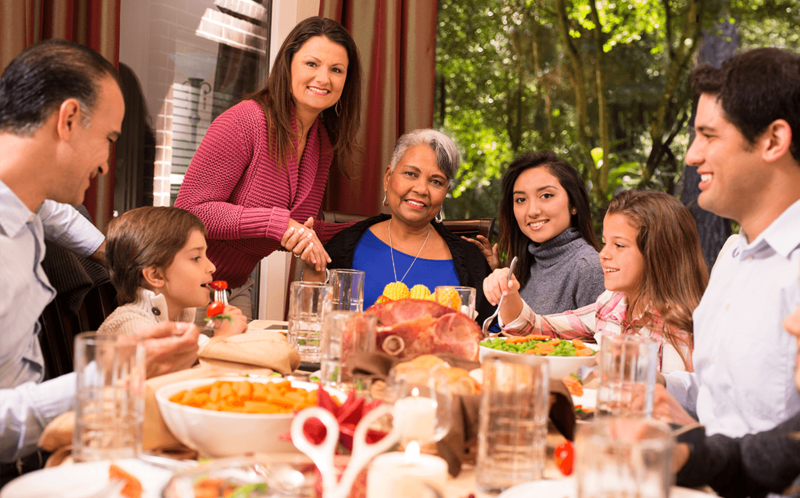 Whether it’s with a significant other’s side of the family, or perhaps a new friend’s, we all want to make the best impression possible for a memorable get-together. The following are a few pointers that will soothe your nerves and amp you up to be the light of the party, so you and your new family become fast friends. Think of your first Thanksgiving with a new family like an important job interview. You need to be prepared, and most importantly, you need to impress. Being prepared means talking to your significant other beforehand to try to get a sense of everyone’s personalities, interests, and quirks before you join the mix. If you know that Uncle Rob loves football, try to prepare a few conversation points. You don't have to become a guru by any means, but having a clue about your new family’s hobbies will help put everyone at ease. However prepared you are, you also should learn to relax. Make every conversation and gesture as natural as possible, so you don’t seem overly rehearsed. No one likes insincere people. The balance is being yourself but also being open to new experiences and traditions with your new family. If you sell a personality that is not you, keeping up with the act will eventually get too exhausting to keep up. Highlight the parts of yourself that your family already adores and enjoys—be a great listener, lay down that charm, or tell an enticing story—whatever your skills, make sure to use them. Every family is unique, and no two Thanksgiving’s are alike. Pay attention to the small details of your new family’s celebration and show interest and excitement in being a part of their traditions. Okay, there’s no way around it—some families love to argue. Whether it’s politics, religion, or any other sensitive subject, holiday’s can be a battleground of tough conversations. Being new to the game can be a bit intimidating, but remember, you didn’t come to argue; you came to make a lasting, positive impression. Use your judgment and don’t walk away from a problematic discussion if it happens, but ease your way into a new conversation that soothes any bad feelings. They will be more than impressed by your ability to hold your own and also lead everyone to a more fertile ground. There is no avoiding the infamous first Thanksgiving with your significant other’s family. All you can do is be prepared, be yourself and also be kind and compassionate. Enjoy the time for togetherness, and before you know it, you’ll be part of the family!